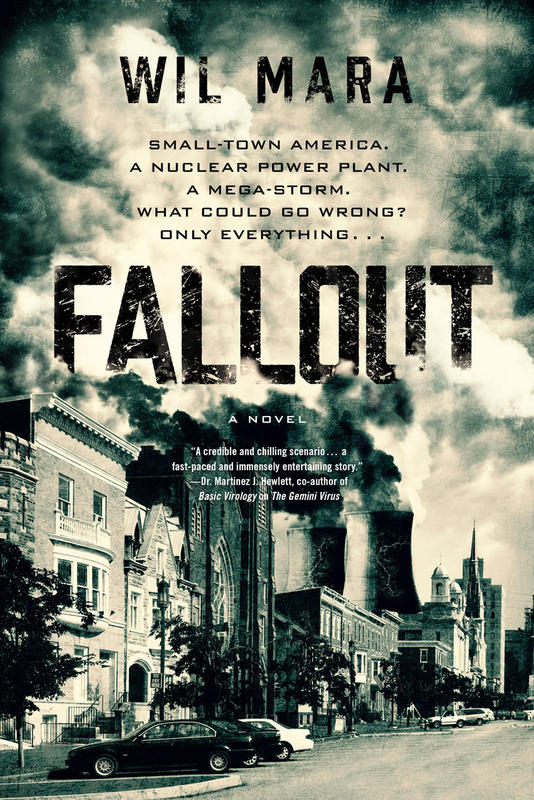 Goodreads is offering the chance to win one of five copies of Wil’s next disaster thriller, Fallout. Entry is free and open to all! Click here for more information. For full details about the book, click here. An ancient organism, reborn in a vicious new strain and spreading fast…. A terrified society, growing more savage as the death toll climbs…. The most powerful nations of the modern age, baring their teeth and on the brink of launching World War III…. And one man, gifted with genius but tormented by a horrible past, working frantically to find a solution…. The newsmedia call it ‘The Black Plague of the 21st Century,’ and the prelude to the long-predicted end of all things…. But in fact it’s just the beginning…of The Gemini Virus. The following are podcasts concerning The Gemini Virus and recorded by Wil in August of 2012. They are .mp3 files, run about five minutes each, and can be accessed by right-clicking on the title, selecting “Save Link Target As…” (or similar, depending on your browser), then saving the file to your computer. Or, if you prefer, you can simply click on the title, and the file should begin playing automatically in a new broswer window. The following is the official promotional video for The Gemini Virus. Just click on the image below, and it will play in a new browser window automatically. (Adobe Flash Player is required, which most browsers already have installed. If your does not, you can get the latest version by clicking here.) If you still can’t view the clip, please note that it has also been posted on YouTube (here) in a form that is all-computer friendly. Wil did the audiobook reading of The Gemini Virus over a three-day period in July of 2012. Below is a free sample of the Prologue in its entirety. Simply click on the link and it will begin playing (in a separate window). If you wish to download it (about 45 MB / .mp3 format), right-click and choose ‘Save Link Target As…,’ etc. Wil also composed and performed three possible pieces of incidental music for the Gemini audiobook. All three have been posted below. The first is the one that was ultimately chosen. PLEASE NOTE that you can order the full audio version of Gemini through Amazon.com by clicking here. ”This is one of those books that you look up and realize you’ve read 50 pages without noticing that any time has gone by…. ”The best part, in my opinion, was Mara’s imagining of how the epidemic would play out on the social level. What would the press say? What would President Obama do? How would other countries react, and how would the disease impact international diplomacy? He even considers the economic impact, on tourism in Hawaii for instance, or on local grocery stores. ”Mara also chooses one family, the Jensens, who live near the disease’s ground zero, to follow throughout the outbreak of the epidemic. At first they try to maintain normalcy for their children, but when all hell breaks lose they decide to head to their vacation cabin with piles of canned food in hopes of riding it out alone. Their experiences provide an individual perspective on the social issues and remind us that, for the victims in an epidemic, disease is personal. “With all of the possible disaster scenarios, the point is not what’s going to happen. The point is, how did it happen, how did people react, and what could be done to prevent it? And for the macabre-minded, let’s not forget, what are the gruesome symptoms? It is in these areas a disaster story can set itself apart. And Wil Mara manages to set The Gemini Virus far apart from others in the genre. “The primary POV characters are two epidemiologists trying to track down and cure the virus, and a regular guy trying to keep his family safe. All three characters have strengths and weaknesses, well-developed pasts, and even moments of heroism. They make decisions, they have regrets. They wonder what they could have done differently, if and how they will be judged for what they did, and how they’re going to make it through to the other side of the virus. They make you wonder how you would react in the same situation, and what choices you would make, which is arguably the point of all literature. “The fictional representation of actual people and places felt true, as did the conversations between epidemiologists. Some explanations were very scientific…but they were short, they fit the scenario, and they did not negatively impact the flow of the story. “The Gemini Virus was one of those books where I wasn’t exactly sure what I was going to get when I picked it up. I knew it would either really freak me out or it would seem implausible. It wasn’t the latter. The first few pages were pretty gross. Like total cringe-worthy, ‘I’m glad I’m not eating right now’ gross. Still, they were real. Everything about the book felt very, very real. “The premise is very simple on the surface—people get sick. People realize there’s an epidemic. People try to appear calm. Loved ones show symptoms. You get the idea…. It’s the execution that drew me in and kept me glued to the pages. I seriously couldn’t stop reading this one, and when I did, it was to research whether or not this could actually happen. (It can—everything in the book is based on scientific fact.) The characters are relatable, the plot tightly woven, and the medical jargon isn’t so heavy that it weighs down the pace. “If you are a fan of medical thrillers, or like movies like Contagion and Outbreak, I would definitely recommend this one. It definitely made me think (and got my slight neurosis all in a twitter). “The end of the story, partly bitter, does not spare us an effective twist, which keeps the reader alert to the very last page. It is clear that Mara wanted to propose a plausible plot for effective entertainment that also made the choice to leave ample room for elements of realism, even with attention given to the scientific aspects. The realistic nature of this so-called ‘disaster fiction’ even went beyond Mara’s stylistic choices—the novel was released in Italy for the first time in November 2012, just after Barack Obama was re-elected to the presidency of the United States. With Obama as a minor character in the book, such events make the book seem less fantastic…and, if anything, more futuristic. “Another aspect to note is the presence of elements in The Gemini Virus that enable the book to fit into several different genres. There is the aforementioned political element, bits of medical realism, and then the horror—splashes and sprays and splatters with terminally ill patients who are reduced to near-zombies dripping with blood and pus; material that does not seem out of place even in Gargoyle’s classic horror stories. One delicious little present comes in this description—“The skin had come off, covered with swollen blisters, crusted and sticky. It was literally slipping away from the body, like flesh from the bones of a roast cooked over low heat, and then accumulating in small piles on the bed.” And this—“The face had been altered so radically that it was impossible to imagine what he looked like once. The pustules varied in size from those of a marble to those of a golf ball. One hung from his cheek, ever so sickeningly, like a large drop of water. ”It is one of the most convincing apocalyptic novels of recent times…. ”What initially seemed to be a common flu is revealed instead to be a deadly infection that can spread like wildfire, in a few hours, with devastating results—empty streets and parks, schools, homes, offices, abandoned military bases, and bodies left to rot in every corner. The effect of The Gemini Virus is mass hysteria, agony, and death. And it is all inevitable. ”The protagonists of the novel are Dr. Beck and Dr. Porter—two epidemiologists who have been tasked to track down and eradicate the virus—and Mr. and Mrs. Jensen—who, in contrast, will do anything to protect their family to escape the effects of the deadly contagion. And it is this choice of the double perspective makes the novel even more compelling. The reader can relate to Mr. Jensen through his own fears and doubts, while at the same time feel involved in the scientific conversations and reflections of the professionals. The novel Mara has created is, in short, incredibly realistic, not only for the precision with which he deals with the technical issues, but also for its social, economic, and political impact. President Obama, for example, becomes suspicious of Iran’s possible involvement now that the nation is led by Ahmadinejad’s successor. And the alarmism spread by the press, and further set in motion by the machinery of world diplomacy, brings to mind the climate of terrorism and continuous high tension that has characterized international relations throughout the last decade. “Art, as Georges Braque said, is meant to disturb. Wil Mara’s The Gemini Virus is a thriller about a virus that spreads as fast as the reader turns pages. Every once in a while you find a book that hooks you so hard you’re yanked through its pages so fast that when you finally breathe and look at the little numbers up in the corner you’re bonafide SHOCKED at how far into the book you already are. And at a lean less-than-300 pages, that makes The Gemini Virus burn as hot as the fevered characters who endure the wrath of this most horrid of new bugs. This one’s almost Ebola meets smallpox on steroids. “Mara manages a multi-layered story in the relatively short page count and juggles a complex plot and equally complex ensemble cast of characters…. Among the subplots/character arcs are: (A) Beck, of the Center for Disease Control, and Porter, a viral scientist, race to find the origins of and cure for, respectively, the ‘Gemini Virus’; (B) the political intrigue, tension mounting between countries as the possibility of terrorist involvement is pondered; (C) the story of an everyday family—they even have a pooch—on the run from the virus. There’s lots afoot but those are the three main storylines—other than the general mayhem caused by an uber-deadly virus snuffing lives with a quickness. That last subplot that got on my nerves just a little, but that’s just me. While I felt it was unnecessary—the political storylines served as sufficient breathers between scenes of Beck and Porter, etc.—many readers might connect with the all-American family caught in a horrid ordeal bigger than them and beyond their ability to control. Besides, their tale connects with the overall sweep of events in a most interesting twist. “Speaking of such, The Gemini Virus packs enough of those and pulls some clever, exciting and surprising denouements out of Wil Mara’s hat of writing tricks. It’s King’s The Stand (minus the supernatural) filtered through the streamlining effects of Michael Crichton, with a bit of Koontz’s humanity—and love for dogs. “To write a noteworthy apocalyptic novel takes great skill and courage. The first danger, of course, is to avoid the systematic use of cliché, which is so common in the horror subgenre. Secondly, the ‘spectacle of death’ that the writer calls on stage can easily degenerate into boring splatter effects. “In The Gemini Virus, Wil Mara wins these challenges by anchoring his dystopian nightmare to real, everyday lives. The exceptional nature of the event—a deadly virus that spreads among the American population claiming victims by the thousands—is a narrative built around two groups of ordinary characters—the Jensen family, and a handful of doctors led by the brilliant Michael Beck. Thus, the spread of the virus and the consequent panic is viewed from the perspective of a normal family on the run while being monitored by a team of experts at the center of events. “The scientific knowledge and epidemiological details necessary for this type narrative are accurate without becoming academic…. The writing is most successful, however, when relating to the Jensens—father, mother, son and daughter—an ordinary family forced into an abnormal environment. So many of today’s fears are generated by countless modern prophecies, but Wil Mara instead favors a more concrete form of evil—a viral killer visible only under a microscope. Thus, The Gemini Virus tweaks some very sensitive and realistic strings. Who does not remember the hesitation to consume green leafy vegetables in the aftermath of Chernobyl, or the phobia for anthrax after September 11? The theme of the plot is present, but remains unsettlingly in the background without acquire centrality. Instead, at the center is always man, real and believable, with his fears and weaknesses. “Barack Obama is at the helm of the United States when a terrible and deadly virus breaks out on the East Coast, not far from New York City. Mistaken at first for a simple flu, its spread is so rapid and fatal that all American cities are virtually transformed into lifeless wastelands. Michael Beck and Cara Porter are CDC epidemiologists searching desperately for way to defeat the epidemic and save millions of lives. Meanwhile, Dennis and Andi Jensen must find a place of safety at all costs in order to save their young family from being infected. “A contagion that threatens the world lies at the heart of The Gemini Virus, a book that is very much welcome from a versatile and prolific author, and a gem to be added to the necklace at Gargoyle Publishing. “The apocalyptic, medical-thriller subgenre, which has been very successful on the big screen with films such as Contagion and Outbreak, is enhanced by this superb novel, which, according to many reviewers, possesses a remarkable structure. The Gemini Virus comes to us from the mind of Wil Mara, who has written for both adults and children, and Gemini represents a new type of book for Gargoyle Publishing, who normally offer works of horror and gothic fiction on a great literary level. A dynamite bookmark has been designed for The Gemini Virus—click here to take a look. You are welcome to download it (right click, choose ‘Save Image As…’, etc.) and print it out. At 6” x 2”, it is an ideal bookmark size. You can get a copy of Gemini through several online retail sites by clicking one of the quick links below. More will be added in the future. Click here to order from BARNESANDNOBLE.COM. It’s a beautiful spring morning on Long Beach Island, one of New Jersey’s most famous and beloved summer destinations. Thousands are beginning their day oblivious to the horror that is about to rise from the sea. Wave was released in May of 2005 and became an instant summer hit—so much so that its publisher, Plexus, had to order a second printing within 90 days. Articles praising the book’s fast pace, well-drawn characters, and accurate scientific detail appeared in numerous newspapers and magazines. Wil made countless appearances at bookstores, libraries, and discussion groups, including an interview with the incomparable Joan Hamburg, on WOR 710 AM, in late August. Wave was selected as one of twenty “New Jersey Notable Books” (and one of only two novels) by the New Jersey Center for the Book. To qualify, each nominated book had to be published between 1995 and 2005 and had to bear a New Jersey theme, flavoring, subject matter, and so on. For more information about the New Jersey Center for the Book, and about the other nineteen titles that were selected for this award, click here. Winning Awards—Are Authors Always the Last to Know? Click here to read the first chapter of Wave. Note: This requires Adobe Acrobat 6.0 or later. Chances are your machine already has this program. If not, you can download it for free by clicking here. Click here to read the “optional” Epilogue to Wave. Please be aware, however, that this contains certain ‘spoiler’ details. It is strongly recommended that you read the book first. Note: This requires Adobe Acrobat 6.0 or later. Chances are your machine already has this program. If not, you can download it for free by clicking here. Click here to order Wave, in paperback, from AMAZON.COM. Click here to order Wave, in paperback, from BARNESANDNOBLE.COM. Or click here to order one of the hardcovers from the original publisher. The following is a list of questions that have been asked with notable frequency during the promotion of Wave. Did you write Wave before or after the Asian tsunami of December 2004? Long before—the first draft of Wave was written from February to October of 2002 and delivered to the publisher before the end of that year. We were going to press when the Asian tsunami struck. We decided to hold off its release out of respect for the victims—we didn’t want to put it out in January for fear that it would appear as though we were trying to capitalize on the tragedy. So, we waited until the start of the summer season. Is the disaster scenario in Wave possible? Could it really happen? Absolutely yes. The decision was made very early on that the book would not be written if the tsunami wasn’t credible. If the science wasn’t ‘within reach,’ then the book would’ve lost a lot of its dramatic impact. It was researched down to the tiniest detail, and to do this I had a lot of help—most notably from a great guy who works for NOAA over on the West Coast. Without him, the horrors of Wave would not be half as convincing. But all that aside, it is foolish to think a tsunami couldn’t strike the eastern shores of the United States, or that someone—some ordinary person with the right equipment, the right knowledge, and the wrong kind of motivation—couldn’t ‘create’ one. To think that’s impossible is to be voluntarily ignorant. Is the character of BethAnn Mosley based on a real person? The following audio clips (podcasts) have been taken from various media interviews. Clicking on a title below should open the sound file in a new browser window, in which case the file will begin playing immediately. These are .mp3 files and will work on most modern media players, including iPods. To download a podcast, right-click on the title, select “Save Link Target As…,” then save the file to your hard drive. The importance of getting the science in Wave correct. A few surprises that followed Wave‘s publication. Wil’s interview with WOR’s Joan Hamburg from August of 2005, in its entirety. Runs just under 10 minutes.